smart is launching a special model that is characterised by high quality equipment, fine materials and an unusual appearance. The new smart fortwo edition highstyle features exclusive paintwork in trendy chocolate brown metallic and elegant 12″ spoke 15″ alloy wheels. The exclusive interior of the special model boasts a harmonious mix of fabric and leather. The smart fortwo edition highstyle is available with a 52 kW/71 hp or a 62 kW/84 hp petrol engine. The 52 kW variant is fitted with a comfortable automatic start/stop system as standard which shuts down the engine when the vehicle is stationary, noticeably reducing fuel consumption. Style, savoir vivre and zest for life go hand in hand with environmentally friendly technology. Even at first glance the new special model demonstrates its high standards of style and elegance with its classy chocolate brown metallic finish. 15 inch alloy wheels in an elegant 12-spoke design and edition highstyle logos in aluminium look are further highlights that round off the exterior appearance to perfection. The classy design of the interior also demonstrates a young spirit, an open, new way of thinking and a confident style. Exclusive, gleaming metallic leather on the seats and in the doors contrasts with the light and dark fabric ensemble reserved for this special edition. Decorative brown seams are a subtle reference to the exterior. The kneepad and instrument panel have a leather look. 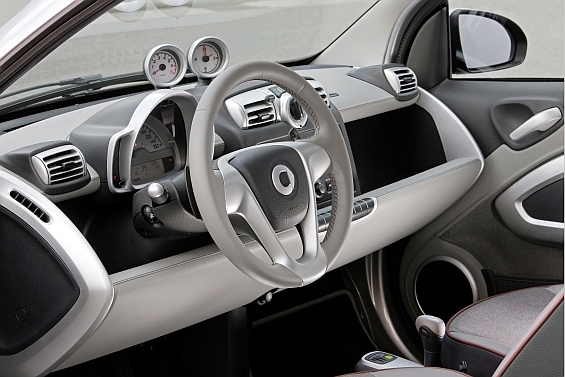 The 3-spoke sports steering wheel with steering wheel gearshift is covered with leather, as is the gear knob. Trim parts that shimmer in matt silver round off the high quality yet dynamic impression of the interior. The new smart fortwo edition highstyle is based on the coupé passion. Among other features this equipment line comes with softouch automatic gear programme, electric windows, air conditioning with automatic temperature control, and a panoramic roof with sunblind. The standard equipment of the “edition highstyle” also includes dashboard instruments and the radio 9. Electric power steering, heated seats, a lockable glove compartment and the smart sound system with a smart MP3 interface are optionally available. 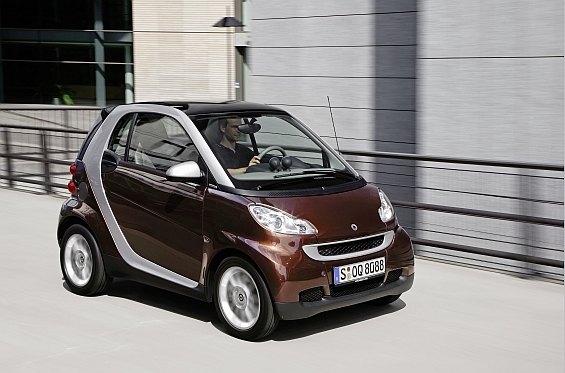 The new special model also demonstrates the smart fortwo style when it comes to environmental friendliness. Not only does it fulfil the strict exhaust gas standard EU 5, the 52 kW variant is moreover fitted with micro hybrid drive (mhd) technology as standard. This clever and comfortable automatic start/stop system shuts down the engine as soon as the driver brakes and the vehicle’s speed falls below 8 km/h – for example when approaching traffic lights. The engine starts again in the fraction of a second when the driver releases the brake pedal. The system is fully automatic – the driver does not need to do anything. In urban traffic with frequent stop and go situations, fuel savings of almost 20 percent are possible with mhd. The special smart fortwo model edition highstyle is available with a 52 kW/71 hp engine fitted with mhd or with a 62 kW/84 hp engine and costs 15,695 Euro and 16,195 Euro respectively (German list price including VAT).